We are in the business of advocating breast milk where possible. Our viewpoint is only strengthened by recent data suggesting that some infant formulas have inappropriate levels of protein in them which lead to an increased BMI in the first two years of infancy and obesity in childhood. “Breast milk is actually quite low in protein, so where breastfeeding is not possible a low protein formula should be chosen – but this advice is not being dispensed to parents and carers,” says Professor Davies from the Children’s Nutrition Research Centre at the University of Queensland. According, to a pilot survey administered to 200 GPs in Australia, only 6% of doctors were aware that excessive protein in a child’s formative years is associated with obesity. Only 4% were familiar with the NHMRC Infant Feeding Guidelines, which state that where breastfeeding is not possible a low protein formula should be selected. A study published in the American Clinical Journal of Nutrition, backs this finding. The study involved more than 1600 healthy infants in five European countries and found that children fed high protein formula had an increased BMI in the first two years of life. By the time they were six, 10% of the children who were on the high protein formula were classified obese compared with 4.4% for those fed low protein formula and 3% for breastfed children. Their weight had increased but without a corresponding height increase. A protein level of 2.2 g per 100 kcal is perceived to be a moderate level. 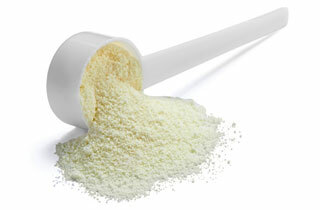 A protein level of 1.9 g per 100 kcal is thought to be lower than or the same as mature breast milk. Families need to be savvy when choosing their formula options in the supermarkets. If you would like a copy of the pilot study of GP responses please email us here.